What took so long? I'm not talking about a LEGO Marvel game. LEGO getting the Marvel license is a relatively new development, all things considered. They announced it in 2011, video game in 2013 — that's fairly quick turnaround for a game as massive in scope as LEGO Marvel Super Heroes. What I am talking about is an open world video game where I can pick from any of more than 100 Marvel heroes and villains and just go to town. Flying through the skies as Iron Man or the Green Goblin. Barreling through the streets as the Hulk or the Juggernaut. Swinging by a thread as Spider-Man or Venom. Causing destruction, saving the day — whatever. Give me the Official Handbook of the Marvel Universe to play with, a major city as my playground, and that's all you need to keep me occupied for days. We've seen games featuring a wide array of Marvel characters, but none that gave us such freedom. The Marvel Vs. Capcom series let us fight, but that's all. Marvel Ultimate Alliance gave us a huge roster, but limited play space. Even Marvel Heroes, the massively-multiplayer online role-playing game, sticks to an isometric view, instead of giving players the freedom to roam of a City of Heroes. So this is the game I always wanted, just not in the form I expected. Thankfully I am somewhat of a LEGO fan, so the blocky countenance of my favorite characters is something I can overlook, perhaps even revel in, just a little. "Ah-ha, he's a fan of LEGO, so obviously he's going to like a LEGO video game." Not so! The LEGO video games have steadily worn on me since those first brilliant LEGO Star Wars titles. I enjoy the aesthetic, but with each subsequent release — LEGO Batman, LEGO Indiana Jones, LEGO Harry Potter, LEGO Lord of the Rings — I found my interest in playing the games waning. Despite moving closer to an open world with each release, the core was the same — go through story levels, smashing as many things as you can in order to collect bits. You've got endless lives, so there's no danger of failing. 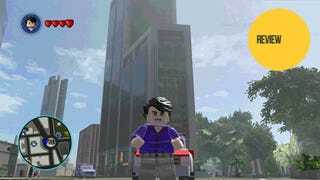 TT Games took a turn for the better with LEGO Batman 2: DC Super Heroes. Here was a game where I could take Superman and fly lazily about the streets of Gotham City. This was good. I wasn't particularly fond of the story, but things were looking up, if you'll pardon the pun. The problem was, dark and dreary Gotham just wasn't a happy backdrop for such a colorful cast of characters. LEGO Marvel Super Heroes gives us New York City, from the skies above to the streets below. Just watch this. Now watch it another 20-30 times, and you'll get a pretty good idea of what I've been doing for the past week. Jumping, flying, diving, running — romping might be a good term. I've been on a romp through LEGO New York City, playing side missions, unlocking new playable characters, and scouring the entire town for secrets. LEGO Marvel Super Heroes is, above all else, a toy box filled with almost every Marvel action figure that matters, and several that don't. ...but it's nice to have the option to roam the streets as Marvel's anthropomorphic waterfowl. Because that's where the fun of LEGO Marvel Super Heroes lies. Exploring the strange and wonderful history of Marvel Comics through this unique playground. It's the ideal setting for parents to introduce children to the heroes and villains that decorated their younger days. It's something to share. That's not saying the story isn't excellent. It's got some great dialogue. And we get to visit iconic Marvel universe locations, from the S.H.I.E.L.D. helicarrier, which serves as our base of operations, to the halls of Asgard to Tony Stark's tricked-out tower. Players are guided from place to place, chasing down the powerful Cosmic Bricks that hold the key to defeating the ginormous villain we all saw coming. Each is magnificently rendered in brick form, filled with moving parts and clever little Easter Eggs for fans of the comics. Ultimate, however, the story is a series of colorful corridors keeping me from the real meat of the game. Oh I'll play the missions over and over again until I've unlocked every character, vehicle and secret the game has to offer, but I'd much rather be at the X-Mansion taking down a Sentinel, or jacking cars and going on joy rides, Grand Theft Auto-style. That's really what I wanted all along. The freedom of a Grand Theft Auto with the characters of Marvel Comics. That's what LEGO Marvel Super Heroes delivers. It's about damn time.